First Appearance: Captain America Comics #1 (Mar. 1941): "Case No. 1. Meet Captain America"
All Select Comics #1 (Fall 1943): "The Case of the Mystery of the Human Bats"
Captain America / Citizen V Annual '98 (Dec. 1998): "For Victory ... Again!" Captain America / Nick Fury: The Otherworld War (Oct. 2001): "The Otherworld War!" Captain America (vol. 1) #215 (Nov. 1977): "The Way It Really Was!" Captain America (vol. 1) #219 (Mar. 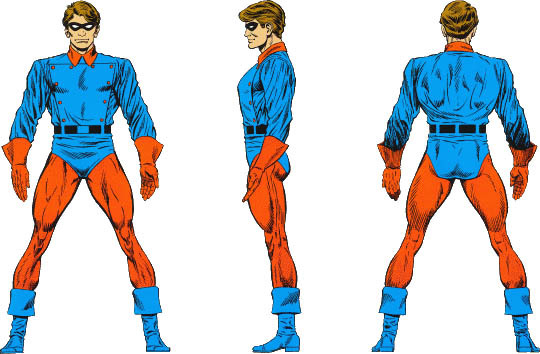 1978): "The Adventures of Captain America"
Captain America (vol. 1) #220 (Apr. 1978): "The Ameridroid Lives!" Captain America (vol. 1) #383 (Mar. 1991): "Fighting Side-By-Side With... Sgt. Fury and His Howling Commandos!" Captain America (vol. 1) #601 (Sep. 2009): "Red, White & Blue-Blood"
Captain America (vol. 1) #620 (Sep. 2011): "Captain America & Bucky Part 1 of 5: Masks"
Captain America (vol. 1) #621 (Oct. 2011): "Part 2 of 5: First Blood"
Captain America (vol. 4) #26 (July 2004): "The Bucky Issue"
Captain America (vol. 5) #8 (Sep. 2005): "The Winter Soldier, Part 1 of 6"
Captain America (vol. 5) #13 (Jan. 2006): "The Winter Soldier, Part 5 of 6"
Captain America (vol. 5) #15 (Apr. 2006): "Red is the Darkest Color"
Captain America (vol. 5) #50 (July 2009): "Sentinel of Liberty"
Captain America 65th Anniversary Special #1 (May 2006): "Secrets of Iron & Fire"
Captain America 70th Anniversary Magazine #20 (Winter 2011): "Case No. 1. Meet Captain America"
Captain America and Batroc #1 (May 2011): "Traceur"
Captain America Annual #1 (Jan. 1971): "The Origin of Captain America!" Captain America Annual #9 (Sep. 1990): "A Soldier's Story"
Captain America Comics #1 (Mar. 1941): "Case No. 1. Meet Captain America"
Captain America Comics #2 (Apr. 1941): "Captain America and the Ageless Orientals Who Wouldn't Die!!" Captain America Comics #2 (Apr. 1941): "Trapped in the Nazi Stronghold"
Captain America Comics #2 (Apr. 1941): "The Wax Statue That Struck Death!" Captain America Comics #2 (Apr. 1941): "Short Circuit"
Captain America Comics #3 (May 1941): "The Return of the Red Skull"
Captain America Comics #3 (May 1941): "The Hunchback of Hollywood and the Movie Murder"
Captain America Comics #3 (May 1941): "The Queer Case of the Murdering Butterfly and the Ancient Mummies"
Captain America Comics #4 (June 1941): "The Unholy Legion"
Captain America Comics #5 (Aug. 1941): "The Ringmaster of Death"
Captain America Comics #5 (Aug. 1941): "The Gruesome Secret of the Dragon of Death"
Captain America Comics #5 (Aug. 1941): "Killers of the Bund"
Captain America Comics #5 (Aug. 1941): "The Terror That Was Devil's Island"
Captain America Comics #6 (Sep. 1941): "Captain America Battles the Camera Fiend and His Darts of Doom"
Captain America Comics #6 (Sep. 1941): "Meet the Fang, Arch-Fiend of the Orient"
Captain America Comics #6 (Sep. 1941): "The Strange Case of Captain America and the Hangman: Who Killed Doctor Vordoff"
Captain America Comics #7 (Oct. 1941): "Death Loads the Bases"
Captain America Comics #7 (Oct. 1941): "The Red Skull / An Ear for Music"
Captain America Comics #7 (Oct. 1941): "Horror Plays the Scales"
Captain America Comics #9 (Dec. 1941): "The White Death"
Captain America Comics #9 (Dec. 1941): "The Man Who Could Not Die"
Captain America Comics #9 (Dec. 1941): "The Case of the Black Talon"
Captain America Comics #10 (Jan. 1942): "Spy Ambush"
Captain America Comics #10 (Jan. 1942): "Hotel of Horror"
Captain America Comics #10 (Jan. 1942): "The Phantom Hound of Cardiff Moor"
Captain America Comics #12 (Mar. 1942): "The Terrible Menace of the Pygmies of Terror!" Captain America Comics #23 (Feb. 1943): "Battling the Deadly Snapper"
Captain America Comics #32 (Nov. 1943): "The Menace of the Murderous Mole-Man!" Captain America Comics #32 (Nov. 1943): "The Talons of the Vulture"
Captain America Comics #35 (Feb. 1944): "The Gargoyle Strikes!" Captain America Comics #37 (Apr. 1944): "The Chambers of Dr. Agony"
Captain America Comics #37 (Apr. 1944): "The Seven Sons of Satan"
Captain America Comics #37 (Apr. 1944): "Frozen Death"
Captain America Comics #42 (Oct. 1944): "Tojo's Terror Masters"
Captain America Comics #42 (Oct. 1944): "Waters of Death"
Captain America Comics #42 (Oct. 1944): "The Baron of Horror Castle"
Captain America Comics #43 (Dec. 1944): "The Shadows of Death"
Captain America Comics #43 (Dec. 1944): "The Death That Came Out of Nowhere"
Captain America Comics #43 (Dec. 1944): "The Sea Dragon"
Captain America Comics #45 (Mar. 1945): "Dynamos of Death"
Captain America Comics #45 (Mar. 1945): "The Thing in the Swamp"
Captain America Comics #45 (Mar. 1945): "The Human Beast"
Captain America Comics #54 (Mar. 1946): "Scarface and the Script of Death"
Captain America Comics #54 (Mar. 1946): "Murder Mountain"
Captain America Comics #59 (Nov. 1946): "The Private Life of Captain America"
Captain America Comics #59 (Nov. 1946): "Pennies from Heaven"
Captain America Comics #59 (Nov. 1946): "House of Hallucinations"
Captain America Comics #66 (Apr. 1948): "Golden Girl"
Captain America Comics #66 (Apr. 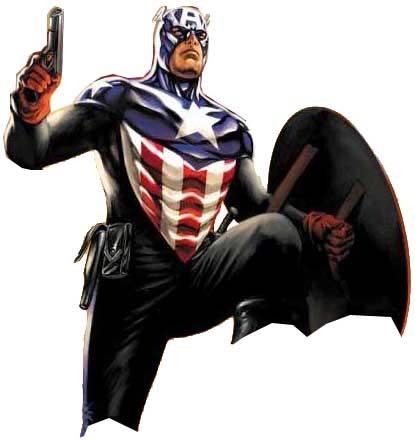 1948): "Swords of the Cavaliers"
Captain America Comics 70th Anniversary Special #1 (June 2009): "What Makes the Man"
Captain America Comics 70th Anniversary Special #1 (June 2009): "Death Loads the Bases"
Captain America Theater of War: America First! #1 (Feb. 2009): "Back from the Dead!" Captain America Theater of War: America First! #1 (Feb. 2009): "The Man with No Face!" 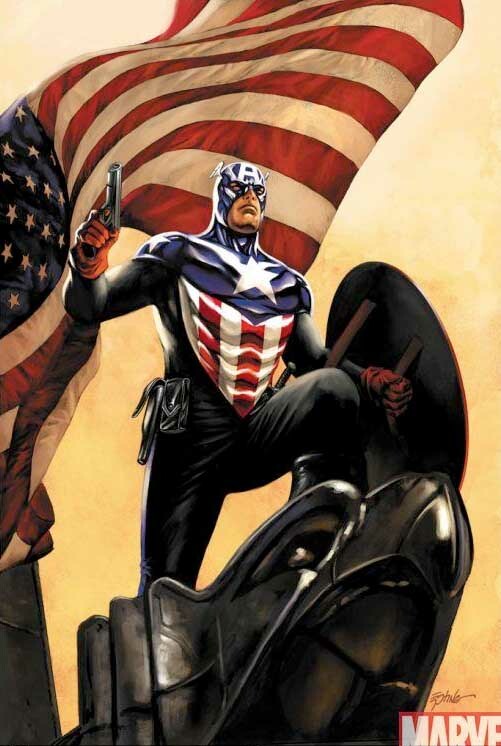 Captain America: Forever Allies #1 (Oct. 2010): "The Origin of Captain America!" Captain America: Sentinel of Liberty #7 (Mar. 1999): "An Ending"
Conspiracy #2 (Mar. 1998): "Print the Legend"
Fallen Son: The Death of Captain America #1 (June 2007): "Denial"
Giant-Size Captain America #1 (Dec. 1975): "The Origin of Captain America!" The Invaders (vol. 1) #10 (Nov. 1976): "Captain America Battles the Reaper!" The Mighty Avengers (vol. 1) #30 (Dec. 2009): "The Unspoken: Part 4"
Tales of Suspense (vol. 1) #63 (Mar. 1965): "The Origin of Captain America!" Tales of Suspense (vol. 1) #64 (Apr. 1965): "Among Us, Wreckers Dwell!" Young Allies (vol. 1) #1 (Summer 1941): "The Young Allies table of contents"
Young Allies (vol. 1) #3 (Spring 1942): "The Coming of the Khan"
Young Men (vol. 1) #24 (Dec. 1953): "Back from the Dead!"